The UK and all other EU members abolished VAT on all investment gold as from midnight December 31st 1999. From January 1st 2000, all purchases of investment gold within the EU are exempt from VAT. Exports of investment gold will be zero rated. A complete list is available on this site, but all forms of gold normally traded as investments are included in the new scheme. 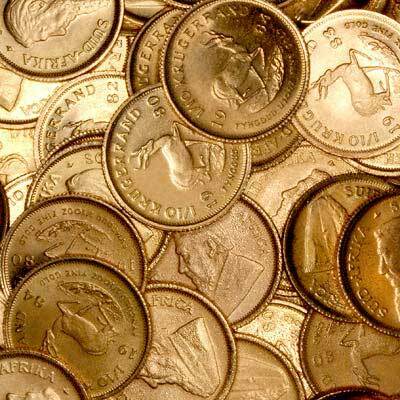 This means most gold bars of at least 99.5% fineness, and gold coins of at least 90% fineness, such as gold sovereigns, Krugerrands, Britannias, maples, and eagles. The exact list and definition of investment gold was only announced late in December 1999, but includes most gold coins which are normally sold at under 80% premium over their intrinsic metal value. This includes almost all modern gold coins, including all gold sovereigns and proof sovereigns. The BNTA, British Numismatic Trade Association was formed in 1973 by the major UK dealers in order to liaise with Customs & Excise about VAT on coins, whether antique, modern, gold, silver or base metal. Chard were members of the BNTA since its formation through to 2008 inclusive. For many years, between 1973 and 1996, we operated a "brokerage" scheme on gold coins enabling us to match private buyers and sellers, so as to legitimately avoid VAT on sales and purchases of coins already in private ownership. In January 1996, the "Special Scheme" for antiques was extended to most classes of second-hand articles, including gold coins, enabling us to sell "second-hand" sovereigns with VAT payable only on our margin. This often meant, however that we could not meet large orders rapidly, as we had to rely in buying solely from private vendors, or other dealers operating the special scheme. We will be bringing you more news about the exemption from VAT of investment gold as we receive it.